Chassidic insight into Hava’s (Eve’s) “error” involving the fruit of the True of Knowledge of Good and Evil, in the Garden of Eden. The full 60-minute recording is presented here with permission from the speaker, Rabbi Manis Friedman. Rabbi Yosef Eisen reviews Torah teachings about the Lost Tribes of Israel in this short audio lecture. Short lecture by Rabbi Yosef Eisen, explaining Scriptural Dating based on the Hebrew Bible. 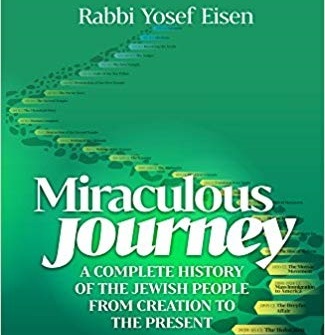 Rabbi Yosef Eisen, author of “The Miraculous Journey”, explains the Hebrew Calendar. Rabbi Yosef Eisen gives a short audio lecture on the history of the Tenth of Tevet (Dec. 18 in 20’18), when the Babylonians laid siege to Jerusalem. Rabbi Yosef Eisen, author of “The Miraculous Journey”, explains the history leading up to the events of Purim. Rabbi Eisen presents a short lecture on the history of the Great Sanhedrin, the Jewish High Court of 70 great Torah Sages from the time of Moses until after the Second Holy Temple. Prophecy was very prevalent among the Jewish people in biblical times. The greatest prophets were also great Torah sages who served as members of the Great Sanhedrin (High Court). Rabbi Joseph Eisen explains the Hebrew creation-based calendar. A review of Biblical history in the generations following the Great Flood in the days of Noah. A review of the world’s decline into idol worship in the early generations after the creation of mankind. Sacrificial offerings to G-d were brought to the Holy Temple in Jerusalem by Jews and Gentiles, and so will it be at the Third Holy Temple in the Messianic Era. Audio lesson on G-d’s speaking the 10 Commandments to the entire Jewish people at Mt Sinai. The Jewish Festival of Shavuot (Feast of Weeks) commemorates this event. The Jewish Festival of Shavuot (Feast of Weeks) celebrates the day of G-d’s speaking the Ten Commandments at Mount Sinai, after which He taught Moses the Oral Torah.